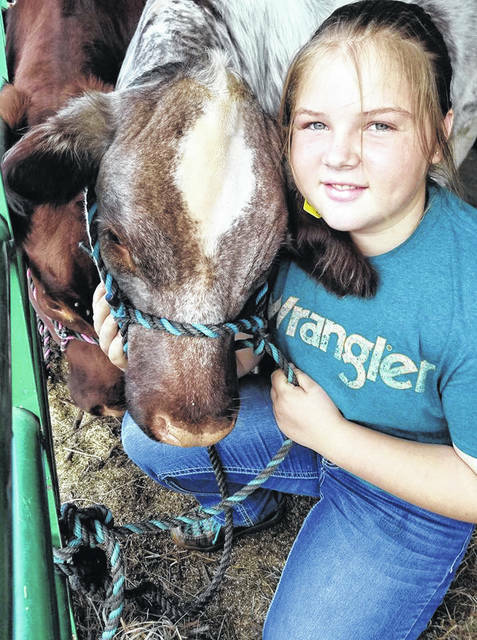 BELLVILLE – Caroline Tilton has some beautiful shorthorn heifers at the Bellville Street Fair. Crystal, the smaller heifer, has a coat that is mottled and mostly white. The coat is fluffy. Her companion, Sweet Thing, is brown, the more expected color. She said on show day animals get groomed and washed, then blown dry. They have a sheen. But does she have a trick? Crystal’s coloring is the result of randomness in breeding. A sire and a dam can both be red in color. But that doesn’t mean the offspring will come out that way, Tilton said. Caroline is part of the crew from Tilton Shorthorn Farms, located south of Bellville, off State Route 13 south. Tilton said she got into showing animals eight years ago. Her father had raised beef cattle and “got us into it,” she said. Her brother also had a steer at the fair. The steer will be auctioned off at the end of the fair, but not the heifers. Her heifer, Crystal, at about 600 pounds, won reserve supreme. Sweet Thing, at 900 pounds, was first in class. Crystal is an animal that would definitely get a second look. Her coat is mostly white. Her face, calm. When she goes to shows, her mother and brother travel with her. Her father stays at home to mind the cattle at the farm. She has participated in the Junior National show for two years. She has exhibited at the Ohio State Fair five years, and at the Richland County fair five years. The situation at the Bellville Street Fair is that exhibitors go home at night. At some fairs the set-up allows people to stay overnight. 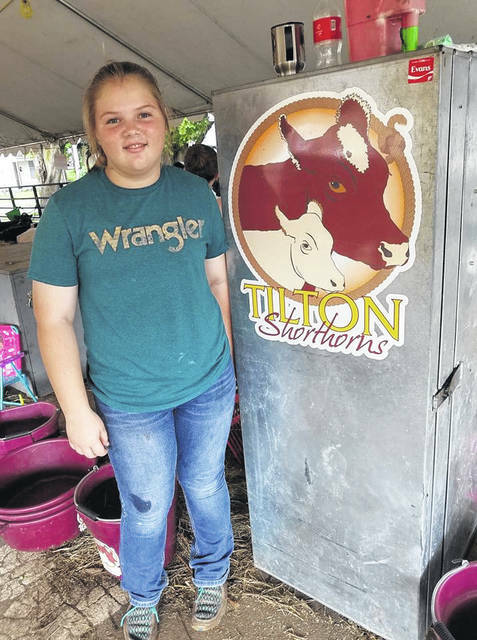 Tilton enjoys being able to show. The Junior National Show is held in various locations. This year’s event was in Madison, Wisconsin. Tilton said she is familiar with the appropriate products for grooming. She uses items from Sullivan’s, which is located in Illinois. At shows she visits their stand, or orders items online. Caroline Tipton, with her Geiger Crystal, at the Bellville Steer Fair. https://www.thebellvillestar.com/wp-content/uploads/sites/39/2018/09/web1_Charlene-Tilton-and-friend.jpgCaroline Tipton, with her Geiger Crystal, at the Bellville Steer Fair.